Balik-Pinas! 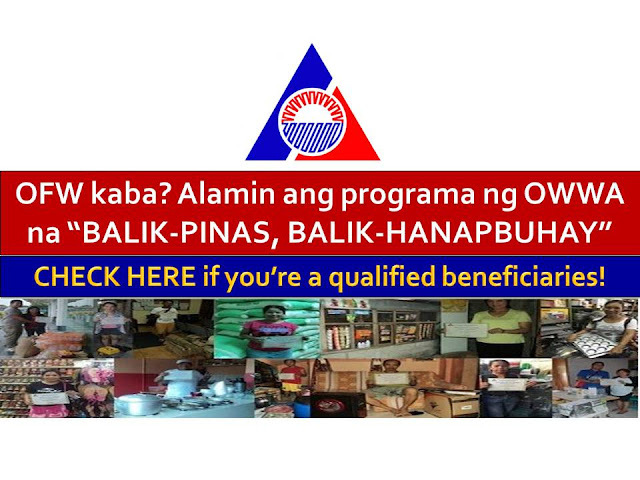 Balik-Hanapbuhay is one of the many programs of Overseas Welfare Workers Administration (OWWA) for Overseas Filipino Workers (OFWs). It is a non-cash livelihood assistance with the aim to provide immediate relief to returning OFWs member. It also enables the beneficiaries to be multi-skilled through access to training services by training institutions like TESDA, DTI, and NGOs. It also equips the beneficiaries with skills that are highly in demand in the local labor market and enables them to plan, set-up, start and operate a livelihood undertaking by providing them with ready-to-go rollout self-employment package of services, consisting of short-duration training, start-up kits/goods business counseling and technical and marketing assistance. Who can avail the program? Distressed wards at the Migrant Workers and Overseas Filipinos Resource Center (MWOFRC) who are due to repatriation. C. Other services that will enable the target beneficiaries to quick start a livelihood undertaking through self/wage employment. OWWA members with finished employment contracts are not entitled to this Program. The program can be availed only once by eligible beneficiaries and within one year after return to the country. Anyone who is interested with the program may contact the nearest OWWA Office in your area for further information. DOES YOUR ATM IN THE PHILIPPINES HAS EMV CHIP OR THOSE WITH MAGNETIC STRIP? YOU NEED TO KNOW.